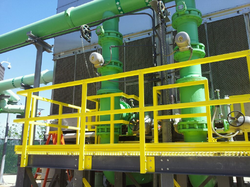 Bluemoon manufactures walkways with isophthalic polyester resin pultruded profiles and FRP gratings to be used as working platforms, machine connecting gangways, raised connecting passages and ramps. Walkways are designed and built to ensure maximum safety. All structures are supplied pre-assembled. 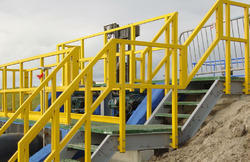 We are offering FRP Walk Way Platform to our clients. 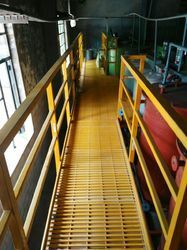 We manufactures walkways with isophthalic polyester resin pultruded profiles and FRP gratings to be used as working platforms, machine connecting gangways, raised connecting passages and ramps. Walkways are designed and built to ensure maximum safety. All structures are supplied pre-assembled. 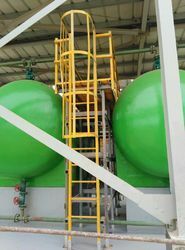 We are offering FRP Platform to our clients. 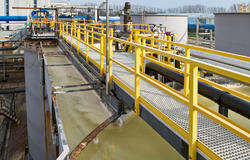 Looking for FRP Platform ?